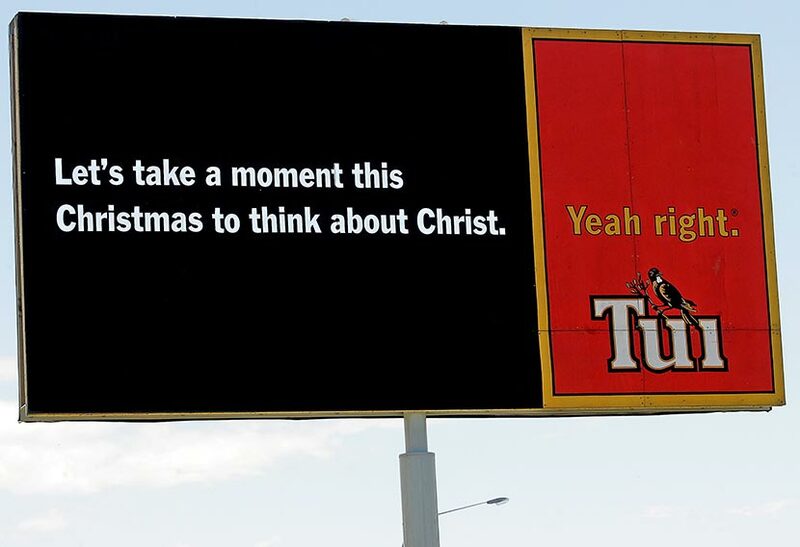 This Tui beer advertising billboard went up in Auckland and other New Zealand locations in December 2008. It drew mixed responses from religious leaders. Some said it made a good point and encouraged people to think about the original meaning of Christmas, but others felt it was in bad taste. The billboard resulted in 86 complaints to the Advertising Standards Authority – more than any other advertisement that year. Complainants typically thought it offensive to Christians, or disliked the link between God and selling alcohol. Dominion Breweries withdrew the billboard before the authority had a chance to rule on it.